Andrew’s meeting saw tensions rise as the table tennis tournament begun at Searls! In celebration of this years Olympic games, Sedgeford hosted its very own Paralympic games. Leon’s meeting saw an evening of “extremely heavy weights” falling out of the ring before tucking into a BBQ. 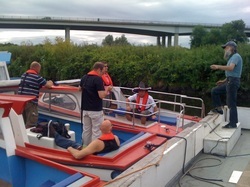 This years chairman’s BBQ was spent cruising the Norfolk broads. The weather held out and a great day sampling riverside pubs was had by all. Huntsanton 615 took tremendous pride in, not only winning the Area Sports Trophy, but thrashing all competitors at every “genuine” sports event!!! 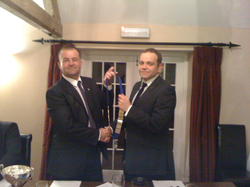 Leon Esply hands over role of chairman to Kevin Waddison. Round table officers have been appointed for the coming year, and awards for service have been presented. Early 2012 we presented a cheque to West Norfolk Young Carers for £2,000 for money raised from our 2011 Road Trip. 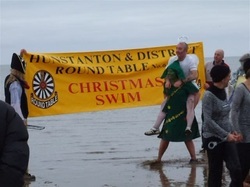 Even the weather was great as we waded out to the 2011 Christmas swim. 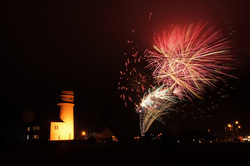 It was another wonderful event and although the tide was out (almost to Skeggy!!) the hundred plus people all made it in and out again safely. Thanks to everyone for turning up to brave the water and in doing so raising money for our local charities. A big thanks to the hundreds who turned up to watch. Cannot wait till 2012 swim!!! After 2 or 3 poor years we asked people to support or risk losing their local display and the response was first class. 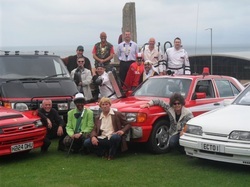 All money raised will be spent on local good causes in the Hunstanton and District area. THANK YOU!!!! Are you a local person or organisation who may benefit from a donation? We review a wide variety of requests on an individual basis, so why not contact us to see if we could be of help!
. As current Norfolk and North Suffolk Area Sporting Champions, Hunstanton and District have began the defence of our trophy by winning the first two events on the calendar. 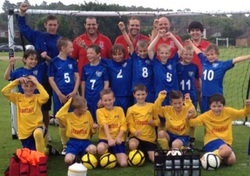 The Raft Racing on the broads was won by efficient teamwork and the 5-a-side football at Dereham saw Hunstanton grind out four victories without even conceding a goal. The scores were 2-0,1-0, 2-0 and a victory in the final of 3-0 over Holt. We are nicely placed to defend our trophy going into the final three events of the Round Table year.